The historic Main Barn at The Park at Harlinsdale Farm. 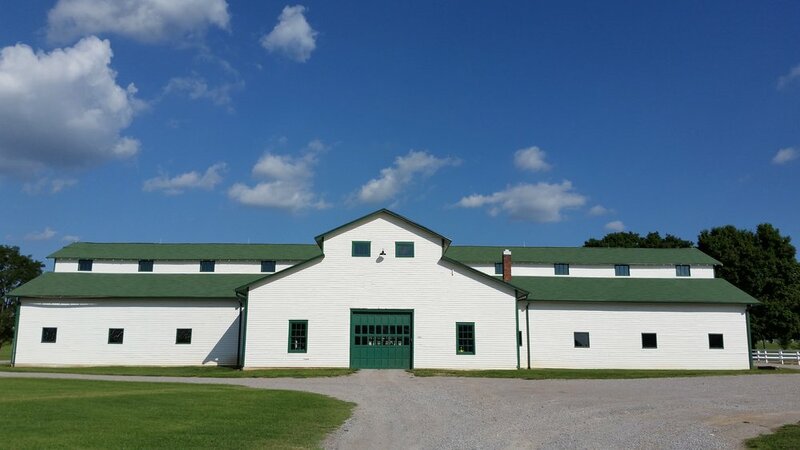 A nationally known horse breeding facility established in the 1930s just north of downtown Franklin, Harlinsdale Farm was purchased by the city of Franklin in 2004, placed under a permanent conservation easement in 2007, and opened to the public shortly thereafter. Harlinsdale Farm has been called the most significant historic farm associated with the Tennessee Walking Horse Industry. In 1933, W.W. Harlin established the farm on the northern outskirts of great renown in the fledgling Tennessee Walking Horse Industry. From the 1940s until the early 2000s, the farm served mainly as a breeding operation, run by the Harlin Family. Friends of Franklin Parks aims to assist the City in restoring this famous Tennessee landmark. The historic Main Barn at the Park at Harlinsdale Farm is an iconic symbol in our community. This year, Friends of Franklin Parks has pledged $300K to this restoration project. With the help from our community, we have reached close to $260K in support of this effort! Please consider helping us get this important project under way! 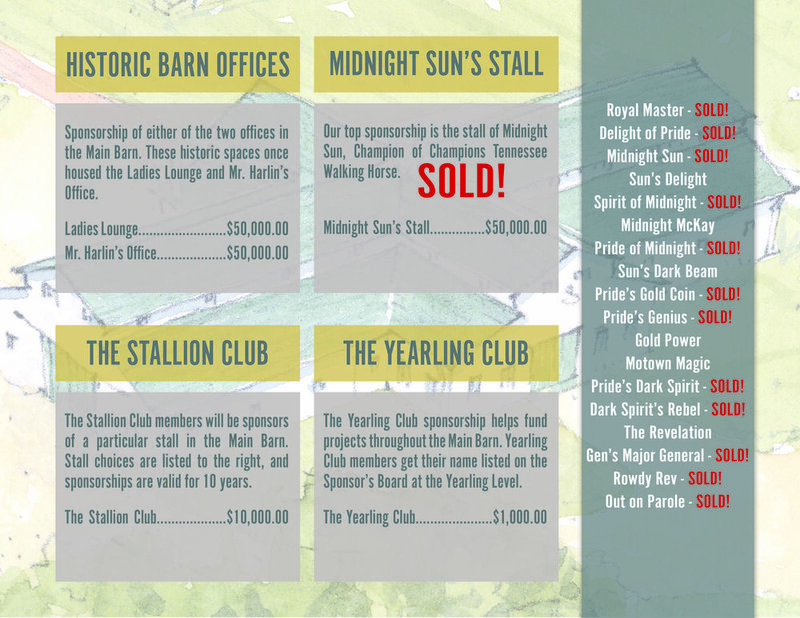 We are offering several sponsorship opportunities, including the Yearling Club Sponsorship at $1,000 (online payment is available below). Please contact us at 615.674.5388 for information on other sponsorship levels. A huge thank you to Pilgrimage Music Festival for their support of Friends of Franklin Parks and their complete support of our efforts at Harlinsdale Farm! We are thrilled to continue to work with you! It is with heavy hearts that we share of Mr. Jim Hayes passing on January 27th. Jim Hayes, the son of Harlin Hayes, at an early age developed a love for radio. He spent a lifetime in the industry building towers and radio stations. Jim Hayes voice was known to many in Franklin as it was often heard on WAGG and WAKM. Jim also became the “voice of Harlinsdale Farm” as he teamed up with Bill Harlin to conduct the farms annual sale of top yearling colts. Jim would read the pedigrees and assure the bidders of the soundness of each entry. After Jim’s father’s passing, he managed to keep all of the family’s famous brood mares intact. He, Bill, and Tom Harlin were not only cousins but also business partners in what was known as the finest group of mares in the Walking Hose Breed. Jim’s smile, stories, humor, wisdom, and “hello cuz” will be missed. Our deepest sympathies are with his wife, Mrs. Judy Hayes and family. Mrs. Judy is a key member of the Harlinsdale Committee and we will continue our efforts for restoration of the Park at Harlinsdale Farm, including his birthplace, the Hayes House, in his honor. FRANKLIN –– Architects released a draft this week of a new master plan that would improve the Park at Harlinsdale Farm in Franklin. The masterplan includes plans for the Hayes House, the main barn, two worker houses, the power station and trails. Franklin's parks department has maintained Harlinsdale since 2005, when the City of Franklin purchased it from the Harlin family. Construction started on the main barn in December 1941. Inscriptions in the concrete foundation mark the date. In the years since, the Harlin family and then the city made only minor renovations. The roof has already been replaced, but still lacks a fire suppression system. Park officials said that puts the barn in danger and requires the fire department to be at the park when events take place. Restrooms, lighting and an air system were also part of the plans. Parks director Lisa Clayton explained that the barn could also have both a historic transformation and provide an event space. Bill Harlin, who died in 2017, owned Harlinsdale Farm starting back in 1937. Clayton said plans for restoring his office are in the works, along with some of the horse stalls. Costs for a full restoration sits around $1.7 million, Clayton said. Friends of Franklin Parks has actively campaigned to restore the 1890s farmhouse known as the Hayes House, which sits prominently at the Park at Harlinsdale Farm. Clayton said the space has a lot of potential. From their planning perspective, it could be used as a public meeting and event space or provide the city with a different park office. Costs to fully restore the house total $586,750, which is around $100,000 more than was projected in 2015. The house needs full restoration work, plus electrical and plumbing. Already, the Tennessee Historical Commission secured grant money for the house. Preservation work is set to begin on the farmhouse's windows this year. As visitors come to Harlinsdale, two small white houses sit to the left of the fence line. The houses –– formerly for workers on the farm –– are also part of the transformation to the park. Both houses need substantial work, Clayton said. She said they could be used for as a park security office, visitor center for the park or for outside programming. The Pilgrimage Music and Cultural Festival already uses the exterior of one of the houses during its annual two-day event. The cost to renovate both is $355,000. The former power station for the farm could merge into a museum for agriculture, Tennessee Walking Horses and the interurban railway. Clayton said the space could be both a museum and event space that could hold up to 400 people. Currently, a shell of the power station is what's left on the farm, with all of its windows taken out. Costs to renovate the 8,800 square foot space would run at $5.6 million. Friends of Franklin Parks, the non-profit organization dedicated to supporting the city’s public park system with private community resources, has added five new members to its board of directors. Hamilton Bowman, a native of Franklin and chief operating officer of Franklin-based EnableComp, is a graduate of Battle Ground Academy and Vanderbilt University, where he earned two advanced degrees. He is a member of the Board of Trustees at BGA, a fellow on the Nashville Health Care Council, and a graduate of Leadership Middle Tennessee. Bowman and his wife, Emily, have two young daughters and enjoy spending time outdoors together as a family. Ken Chin is president of KAC Sports & Events, LLC, a consulting firm that leverages his 25-year sports business career that began with the National Hockey League’s events department. He later served as vice president of events and business development with the Atlanta Sports Council. After a stint as executive director of Denver Sports, he and his wife, Ellie, relocated to Franklin. Chin is currently a consultant for the Williamson County Sports Authority and has previously consulted for the Nashville Predators and the 2016 NHL All-Star Game held in Nashville. He holds a master’s degree from The Ohio State University, as well as a certification in sports and special event marketing from New York University. Clay Harlin brings a lifetime of affiliation with Harlinsdale Farm, as a member of the namesake family. He was involved professionally with the horse-breeding operation from the time he was a teenager until the farm was sold to the city for parkland, and later was president of Mid South Uniform Service in Tullahoma, Tennessee. Harlin holds a degree in Bible and preaching from Lipscomb University, and has worked as a teaching pastor and director of missions, which has allowed him to teach and lead short-term missions in Haiti, Honduras, India, Romania and Ukraine. He retired in 2017 to care for his ailing father, the late Bill Harlin, and enjoys spending time with his wife, Faye, their three adult children and eight grandchildren. concepts across the state. She is the mother to three children who all work in the business and have provided five grandchildren. Matt Roberts works in the Franklin office of Stites & Harbison, PLLC, practicing in the firm’s real estate and banking service group. He grew up in Nashville and Memphis, attended the University of Georgia and then earned a law degree from the Washington and Lee University School of Law. Roberts joins the Friends of Franklin Parks board having served on its Riverwalk and Trails Committee since 2016. He has also served on the board of Williamson County CASA since 2010, and is a past president and chair of the legislative committee of the Tennessee Association of Property Tax Professionals, a member of the Trustee’s Council of the Land Trust for Tennessee, and a member of the Franklin Noon Rotary. Roberts lives in Franklin with his wife, Lauren, and two daughters. In the spirit of the holiday season, Friends of Franklin Parks is offering an opportunity for the public to purchase a tax-deductible paver for $250, and getting a second paver for FREE! The 5" x 10" pavers can be engraved with three lines up to 16 characters each, and purchasers can include any message that honors or inspires.This offer is good through Christmas Day (December 25). Purchase through our website or by calling the Friends of Franklin Parks at 615-674-5388. Purchase your paver by clicking the PayPal link below, or click here to download a form to submit to Friends of Franklin Parks. FRANKLIN — The toe of Monty McInturff's boot scuffed at the dirt inside the barn at the Park at Harlinsdale Farm. On a cold November morning, the inside of the barn was still and its stalls empty. McInturff spent much of his high school years working in the barn before he went on to become an equine veterinarian. He later became the resident veterinarian for the farm from 1991 to 2017. "You don't have to have worked here or spent time with horses inside this barn to know how special this place is," he said. The park — now home to pups, polo and the Pilgrimage Music and Cultural Festival —could soon see some improvement to its main feature. Construction started on the main barn the day before Pearl Harbor in 1941. Inscriptions in the concrete foundation mark the date. In the years since then, the Harlin family and then the city have made only minor renovations. But in 2019, Franklin and the nonprofit Friends of Franklin Parks hope to change that. "For me, it just makes me happy to know this is happening," McInturff said. "Most people don't have a farm. And for some in Franklin, the barn represents their farm. We've been bringing awareness, and now it's time to get this barn up to speed." Clay Harlin can still picture coming to Harlinsdale farm morning after morning, greeted by rising mist and the smell of horses. Harlin is the son of Bill Harlin, who died in 2017. He and his family owned Harlinsdale Farm starting back in 1937. The land stayed in the family until 2005, when they decided to sell the 200-acre property to Franklin. Before it became a public park, the Harlins raised Tennessee walking horses, the most notable of which was Midnight Sun. "I was fortunate to be born at the time that I was," Harlin said. "It’s hard now to maintain a family operation like that. It was an enchanted time. I adored my grandfather and my father, and I grew up under their feet to learn from some of the best in the business." Harlin said he knew the barn had suffered wear and tear over the last few decades. The family has worked with Friends of Franklin Parks to raise money to fix the structure for generations to come. "If someone didn’t restore it, it would be lost forever," Harlin said. "I enjoy seeing people of Franklin enjoy what I enjoy." Back in early November, Franklin Parks Director Lisa Clayton told Franklin leaders that restoring the main barn was needed in the next decade. "The main barn is the most visible on the property," Clayton said. "Whether it's a matter of a private or public event, everyone wants to go into the barn. People love the nostalgia and history.... It's our top priority." Since the City of Franklin took ownership of the barn, crews have reinforced the roof of the structure. But no other major updates have been made, Clayton said. Current estimates put upgrading the barn at $1.7 million, but that could change. By the end of November, Clayton said she hoped to see the results of a master plan from architects Tuck Hinton, who were commissioned to come up with ways to go about a renovation project. Part of the money to help fund the upgrades will come from Friends of Franklin Parks, which has raised $250,000 for the project. Clayton said the most important upgrade would be adding a fire suppression system to the barn. Currently, the Franklin Fire Department has to be on site and all doors have to be raised for events to take place inside the barn. Capacity numbers have to be kept small. "We only have one barn like this in the parks system," she said. "We have to protect it. Because if anything happened to it, it would be gone. And there's not a true way to get something like that back." Restoring the house in its entirety will cost an estimated $425,000, according to the city's capital improvement plan documents. With grant money from the Tennessee Historical Commission secured, preservation work is set to begin on the farmhouse's windows. Friends of Franklin Parks Executive Director Torrey Barnhill and Franklin Synergy Bank Chairman Richard Herrington. Franklin Synergy Bank has renewed a three-year sponsorship with the non-profit Friends of Franklin Parks supporting the Tractor Supply Co. Arena at the Park at Harlinsdale Farm. The Arena, built and operated through a public-private partnership between the City of Franklin and Friends of Franklin Parks, opened for community events in 2016. Franklin Synergy Bank was among the first corporate sponsors to lend financial support to the Arena as funds were being raised for construction. The $1.6 million facility, which includes restrooms, a concession stand, a warm-up ring and a scoring tower in addition to the multi-purpose equestrian arena, has been used for horse shows, arena polo and various public events, such as Franklin on the Fourth and the Pilgrimage Music and Cultural Festival. Herrington said the Arena – as a facility that helps draw people from all over to visit Harlinsdale – helps showcase Franklin’s balance of economic growth, historic preservation and strong family values that make it a great place to live. 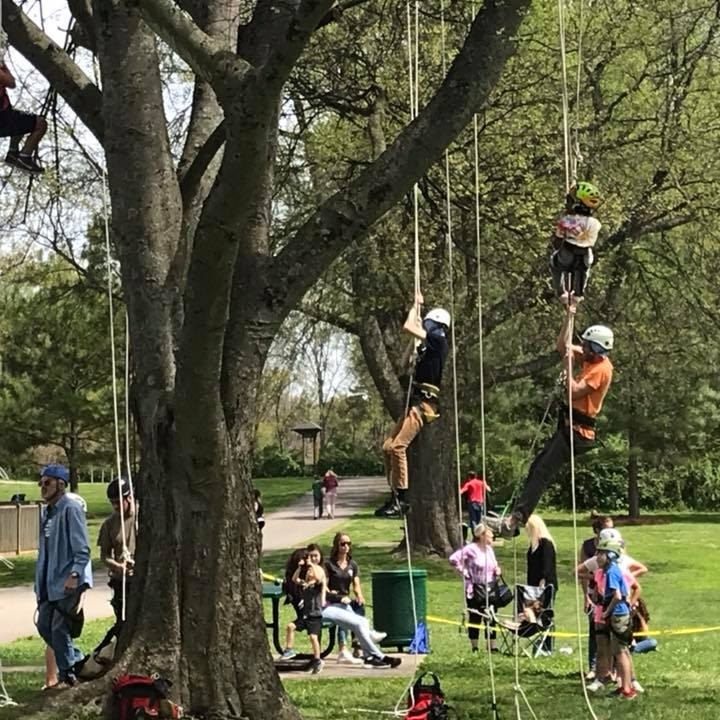 “We have such an outstanding quality of life here, and organizations like Friends of Franklin Parks focus on preserving that unique blend and remind us that family is an important part of our everyday lives,” he said. Torrey Barnhill, Executive Director of Friends of Franklin Parks, said the organization expects to continue attracting events that bring the public together, celebrating the legacy of the property as a historic horse farm while offering opportunities for education and family entertainment. Founded in 1937, the 200-acre Harlinsdale Farm was a nationally recognized breeding operation for more than 75 years before it was acquired by the City of Franklin, placed under a permanent conservation easement and opened as a passive park. A long-range plan to bring horses back to the historic farm was advanced with the establishment of Friends of Franklin Parks in 2011, a public-private partnership designed to leverage corporate and individual support to enhance and grow public spaces around Franklin. For more information on Friends of Franklin Parks, the Tractor Supply Co. Arena, sponsorship opportunities and upcoming events, please visit www.friendsoffranklinparks.org. FRIENDS OF FRANKLIN PARKS BENEFICIARY OF PILGRIMAGE MUSIC FESTIVAL! The Pilgrimage Foundation is the non-profit entity of the Pilgrimage Music & Cultural Festival. Through this foundation funds are raised from donors, ticket sales and other activities in which benefits the parks, specifically Harlinsdale Farm. Over the last three years, the Pilgrimage Foundation has given a total of $52,625 to Friends of Franklin Parks. Thank you Pilgrimage Foundation and we can't wait until this year's Festival at The Park at Harlinsdale Farm! HERE'S WHAT IS HAPPENING IN YOUR PARKS THIS FALL! Buy your ticket now for the best party of the summer! The seventh-annual Friends of Franklin Parks “Raise the Roofs” event will be held on Saturday, August 18th from 5:30 p.m. to 8:30 p.m. The evening will kick off with an interscholastic polo match in the Tractor Supply Co. Arena, then transition to the main event that includes great food, drinks, live entertainment and a silent auction on the lawn of the Main Barn. All proceeds benefit Friends of Franklin Parks and the organization’s efforts to continually enhance and connect the City’s incredible park system. To purchase tickets, or for more information, click here. HERE'S WHAT IS HAPPENING IN YOUR PARKS IN JULY & AUGUST! Due to weather, Yoga in the Park has been rescheduled for June 28. Help us celebrate the International Day of Yoga! Bring your yoga mat or blanket & come join us for a free family day of Yoga fun, health & wellness! This celebration will include family yoga, GOATS, office yoga, mommy & me yoga, giveaways, and so much more! Festivities begin at 10AM at The Park at Harlinsdale Farm. Work continues on upgrades to the Tinkerbell Pavilion at Pinkerton Park! Noticed the work happening at Pinkerton Park? It is the start of the concrete ping pong table and ADA accessibility to the Tinkerbell Pavilion. This project is in partnership with Leadership Franklin, Friends of Franklin Parks and City of Franklin! Click here for more information! The City of Franklin Parks is hosting its annual Kids Arts Festival of Tennessee this Saturday, June 2. This event features art stops, music, an interactive mural, printmaking, art exhibits, foods trucks, & much more! Bring the family to Pinkerton Park between 10:00AM - 3:00PM for this FREE event! After the Kids Arts Festival of Tennessee, head to the Park at Harlinsdale Farm on Saturday for a competitive, commentated polo match! 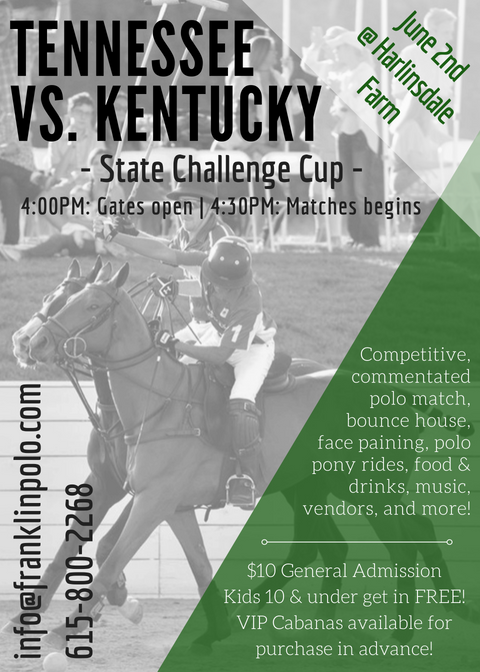 The Franklin Polo Academy is hosting the State Challenge Cup featuring Tennessee vs. Kentucky at the Tractor Supply Co. Arena. Gates will open at 4:00PM and the match will begin at 4:30PM. The event will also feature a bounce house, face painting, and polo pony rides for the kids. Don't miss out on this equestrian themed event with food, drinks, music, vendors, & more! General admission is $10.00 per ticket and kids 10 & under get in FREE! VIP Cabanas are available for purchase in advance by calling 615.800.2268 or emailing info@franklinpolo.com. New to the summer polo series...Stephanie Kantis jewelry will be sold during polo matches with the Friends of Franklin Parks as the designated charity for jewelry sales. Be sure to check out the Stephanie Kantis booth this Saturday! CHECK OUT WHAT'S HAPPENING IN JUNE! We are honored and thrilled to create a space that will be a blessing to many in the future. We are partnering with the City of Franklin and Friends of Franklin Parks for this project. If you would like to be a sponsor of this pavilion contact the Friends of Franklin Park at 615-674-5388, or please consider making a donation below. Click here for more information. CHECK OUT WHAT'S HAPPENING IN YOUR PARKS THIS MONTH! THANK YOU TO EVERYONE WHO ATTENDED THE ARBOR DAY CELEBRATION AT PINKERTON PARK! Friends of Franklin Parks spent a fun day with students from the Boys & Girls Club at Eastern Flank Battlefield Park enjoying Bingo, a corn hole tournament, coloring, a visit from a Water Specialist from the city talking about our water and Harpeth River, and a very special lunch guest, Mayor Moore. We originally had planned for a historic hike, fishing and horse clinic at Harlinsdale but we picked another great park for indoor activities due to the rain. A very special thank you to FirstBank for being FOFP's partner and sponsoring our educational program this year. And thank you to Tennessee Equine Hospital for sponsoring lunch! 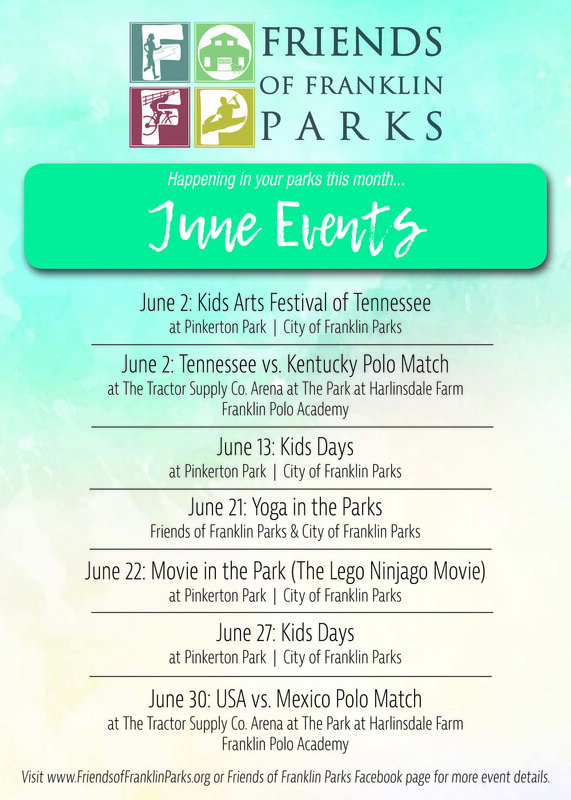 The City of Franklin Parks department has partnered with Friends of Franklin Parks and the Williamson County Library, to create a new opportunity for children and families at Pinkerton Park. On March 2nd, officials cut the ribbon on the new Storybook Trail, an interactive walk and read experience along the trail at Pinkerton Park. Mayor Ken Moore was present to read a story and even a few furry friends from the story were on hand! The exhibit will be ongoing throughout the year and the goal is to change the story annually. Parents can also purchase the book with proceeds benefiting Friends of Franklin Parks. Contact Torrey Barnhill at tbarnhill@friendsoffranklinparks.org for questions or visit friendsoffranklinparks.org. FRANKLIN, Tenn. – The new year has brought more good news for Friends of Franklin Parks: the non-profit organization has added new Board members, elected a new Board president and received a major gift from the Harlin family to support ongoing restorations of the main barn at the Park at Harlinsdale Farm. “We are jumping into 2018 with a lot of momentum, and it is rewarding to have the support of people who are willing to give their time, talents and resources to the important work we do as a non-profit organization on behalf of Franklin’s incredible park system,” said Friends of Franklin Parks Executive Director Torrey Barnhill. On January 3, members of the Harlin family met with Friends leadership to present a check including proceeds from the sale of the last of Harlinsdale Farm’s legendary horses. Upon the passing of Bill Harlin last year, the family wound down operations and offered to donate nine horses and two foals from the legendary Harlinsdale line. Those horses found great homes and will keep the legacy alive for years to come. Friends of Franklin Parks has also added new members to its Board of Directors and named Adam Ballash its new Board president. Ballash, of Boyle Investment Company, helped form Friends of Franklin Parks and has served as vice president of the organization ever since. He oversaw construction of the Tractor Supply Co. Arena at the Park at Harlinsdale Farm and has been heavily involved in connectivity and other Friends efforts in recent months. New Board members include: Braton Machleit, owner of Buzz’d Fly Fishing and co-owner of Harpeth River Shuttle, a Centennial High School graduate and United States Navy veteran who returned to his hometown to pursue his passion for introducing people to the Great Outdoors and the incredible Harpeth River. He lives in Franklin with his wife Molly, two children and a Labrador retriever, Brookie, who often joins him on float trips. Susan Smallwood, a longtime Williamson County resident and community volunteer with organizations as varied as the Tennessee Senior Olympics, TN Achieves and Friends of Franklin Parks’ ad hoc Harlinsdale Committee. A graduate of Barrington College and Trevecca Nazarene University who holds a graduate degree in medicine as a physician’s assistant, she currently serves on the Board of Directors of New Hope Academy, where she chaired the Board in 2012 and 2014. Katie Spence, who works as an internal audit manager with Jackson National Life, focusing on broker-dealer and investment advisory activities and other key risk areas across North America. Katie has more than 15 years of financial services experience in operations, compliance and internal audit, and holds a variety of specialized industry certifications and licenses. She is also an Investment Advisor Certified Compliance Professional with Series 7, 24, 63, 66 securities licenses, and her expertise will be particularly valuable to Friends of Franklin Parks on the development side. 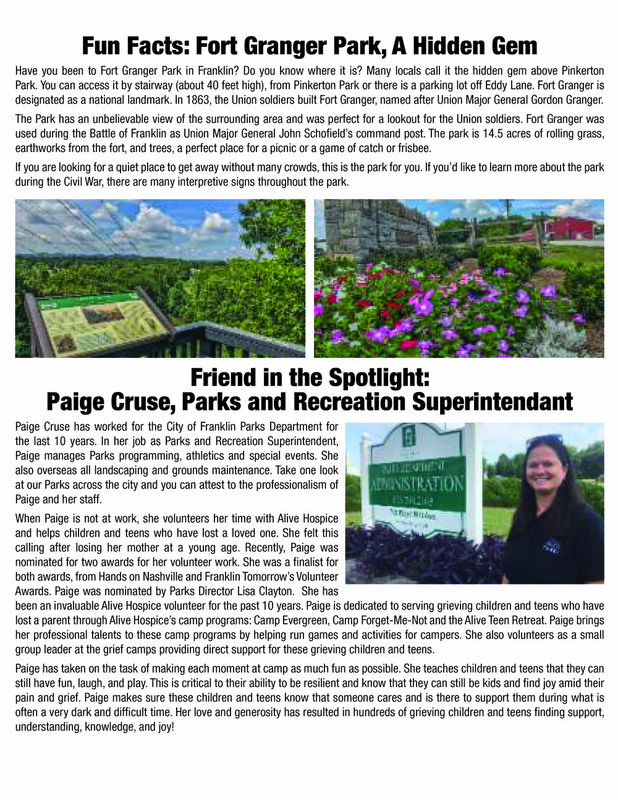 She is an avid cyclist and overall outdoor enthusiast, and will contribute to efforts surrounding connectivity of Franklin’s parks and other key initiatives. Kevin Thompson, a founding partner at Thompson Burton PLLC, is one of the most sought-after attorneys in the country in the direct sales industry. He was recently selected as a Super Lawyer by Super Lawyers Magazine, and is regularly quoted in the national media on legal matters and speaks at conferences throughout the world. He is a former All-American decathlete and a proud husband and father to four children. Ballash, the new Friends of Franklin Parks Board president, says the new slate of directors confirms the momentum carrying into the new year. Come out to The Park at Harlinsdale Farm this Saturday, October 28, for the Walking Horse Owners Association (WHOA) Fall Classic! Showing starts at 11AM at the Tractor Supply Co. Arena. Click here for a full showing schedule. 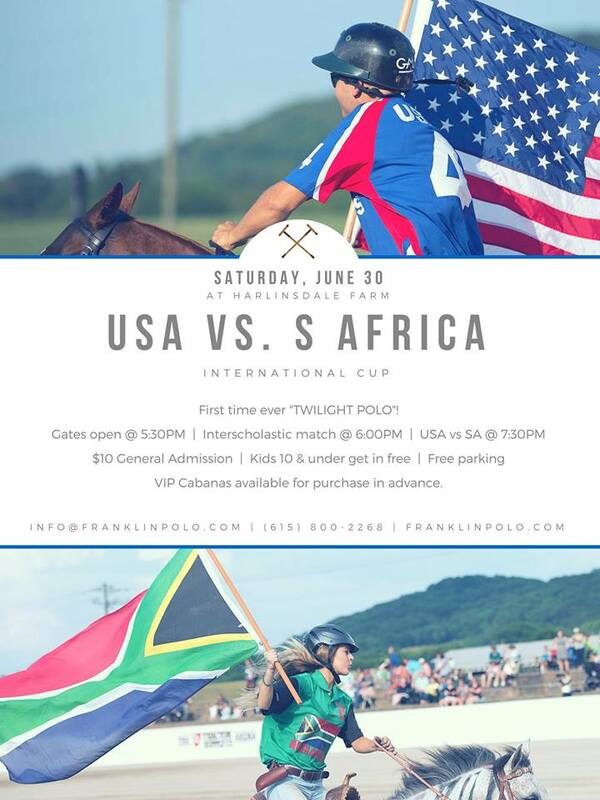 Also this weekend, Franklin Polo Academy is hosting it's second annual POLOWEEN event! Come out for a spooky good time on Sunday, October 29. Gates will open at 2PM and the polo match begins at 3PM. The warm-up match is Superheroes vs. Villains, and the headlining match features Franklin Polo vs. University of Kentucky. General admission is $10.00, and kids 10 and under are free. Costumes are welcomed and encouraged! Food, drinks, bounce house, costume contest, face painting, polo pony rides, music, live commentated polo match, vendors, & TRICK or TREATING! FRANKLIN, Tenn. – Just over one year after opening the Tractor Supply Co. Arena at the Park at Harlinsdale Farm, the City of Franklin’s Parks Department and the non-profit organization Friends of Franklin Parks will cut the ribbon on an adjacent warm-up arena designed to accommodate a range of equestrian and other events. The celebration will be held on Thursday, October 12 at 2 p.m., and the community is invited. The approximately $50,000 project not only added a secondary warm-up arena to the Harlinsdale campus to better accommodate equestrian events, but it also added critical electrical, drainage and irrigation infrastructure that will support other activities in the park, both now and in the future. Three different contractors (electrical, irrigation and drainage, and specialized arena footing) were engaged in the project, and were supported by the Parks Department’s Athletics and Maintenance divisions, who assisted with connections to existing utility systems and the construction of the cross-tie framework in which the arena base material sits. Friends of Franklin Parks Executive Director Torrey Barnhill says the partnership with the Parks Department demonstrates how the timeline on long-range plans can be advanced with private contributions that benefit taxpayers and visitors. As part of the ribbon-cutting event on October 12, the Central Tennessee Dressage Association will host an equine demonstration, and the Boys & Girls Club kids who participate in Friends of Franklin Parks’ educational outreach program will also be on-hand. Light refreshments will be served, and officials will commemorate the occasion. For more information on the Park at Harlinsdale Farm, visit www.franklin-gov.com/parks. To learn more about Friends of Franklin Parks, go to www.friendsoffranklinparks.com. As a sellout crowd enjoyed food and drink from 17 different purveyors on August 19, Friends of Franklin Parks played a video highlighting the fruits of its partnership with the City of Franklin and unveiling big plans for future of the Harlinsdale Park campus. “Our job is to bridge the gap between public and private, and to work with the Parks Department to preserve and enhance our park system. You see that manifested in the main barn at Harlinsdale, the old mare barn, in the Tractor Supply Co. Arena and now a new warm-up ring, but we want to do more,” explained Friends of Franklin Parks President Dr. Monty McInturff. Working with numerous stakeholders, including the City and the Chestnut Bend Homeowner’s Association, Friends of Franklin Parks is developing a plan to connect the park to existing trails on the other side of the Harpeth River, which would allow safe and easy access to Bicentennial Park and downtown Franklin on foot or bicycle. The power station – built near the turn of the 20th century to supply coal-fired power to Franklin – was ultimately replaced by cooperative utility systems after the Great Depression. The historic building was heavily damaged during a storm in 2014. The sixth-annual Raise the Roofs event was presented by Kemp Orthodontics and Randy Jones & Associates. Among a polo match and other horse demonstrations, Nashville’s own Americana-roots favorites Boy Named Banjo played throughout the evening. Bites from Buttermilk Sky Pie; Catering and Events by Suzette; Circa; Chuy’s; Daily Dish; Franklin Chop House; Jim ‘N Nick’s; Juice Bar Franklin; MAFIAoZA’s; Nothing Bundt Cakes; Padrino’s Pops; Pueblo Real; Scout’s Pub; Sperry’s; Taziki’s and Yat’s Cajun Creole will delight the crowd. Lipman Brothers and the R.S. Lipman Company will provide wine, beer and a specialty cocktail. Additional sponsors include: Amy Cross Nance, Attorney at Law; Berry Farms, a Boyle Development; Berry Farms Animal Hospital; Bell & Associates Construction, L.P.; Burr & Forman LLP; Franklin Synergy Bank; Franklin Tomorrow; Jones Bros. Contractors, LLC; Stites and Harbison, PLLC; Tennessee Equine Hospital; TTL, Inc.; and Williamson Medical Center, along with CJC Technologies, Ford Custom Classic Homes, Lee Company, and Barry and Jackie Alexander. For the last three years, Harlinsdale Farm patriarch Bill Harlin has donated horses from his world-champion lines for auction at Friends of Franklin Parks' annual Raise the Roofs event. Harlin passed away in June at the age of 92, and now the Harlin family is honoring his legacy by offering three horses and a foal to the fundraising effort. Raise the Roofs is set for this Saturday, August 19, at the Tractor Supply Co. Arena at the Park at Harlinsdale Farm. "The Harlin family has contributed so much to our community, both with the sale of Harlinsdale Farm to become a public park and in supporting Friends of Franklin Parks' efforts to bring the horses back to that historic property," said Monty McInturff, president of Friends of Franklin Parks. "He left an incredible legacy, and the rest of the Harlin family has stepped up in a big way to continue supporting our efforts to preserve and enhance Franklin's park system." The eight-year-old chestnut mare Summer Adventure and the chestnut colt by her side, born in April, are both rich with famous bloodlines tracing back to the original Harlinsdale Farm and its legendary stud Midnight Sun. Mainly Rowdy, a handsome three-year-old gelding descended from two world champions, will be a great pleasure and trail horse for a child or adult. The chestnut horse has a beautiful flax mane and tail. The third horse made available for auction at Raise the Roofs, the personal horse of the late Bill Harlin's wife Barbara, bears an uncanny resemblance to his predecessor Midnight Sun. Reggie Rowdy is a two-year-old black stallion has the same size, stamina and physical constitution of his ancestor, and Reggie's four-year-old brother recently sold for $18,000. 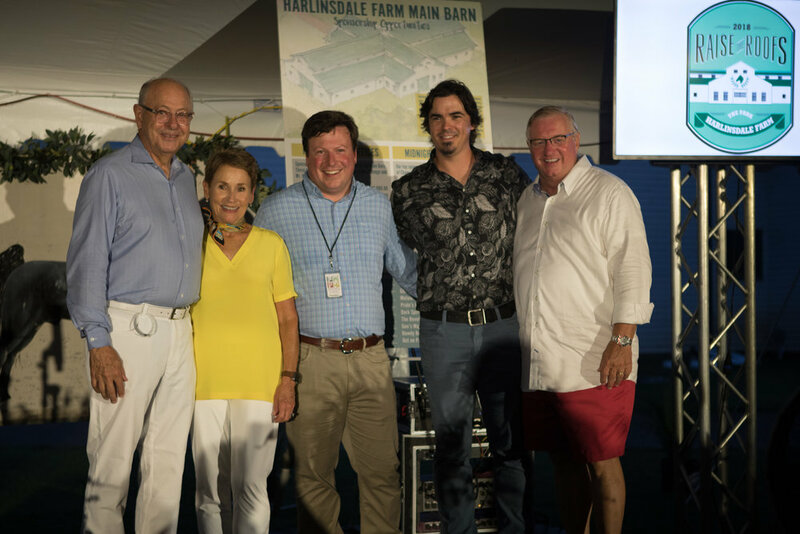 "These generous donations not only preserve and celebrate the legacy of Mr. Harlin and Harlinsdale Farm, but they will make great pleasure horses that families can enjoy riding for many years to come," McInturff said. Saturday's Raise the Roofs event is sold out, but General Admissions tickets are available to a polo match that will be held as part of the event. Gates for the match open at 6 p.m., and the concessions stand will be serving food and drink. More than a dozen local restaurants will be on hand for the sixth-annual Friends of Franklin Parks “Raise the Roofs” event on Saturday, August 19th from 4:30 p.m. to 7:30 p.m. The evening of equestrian-themed fun at the Tractor Supply Co. Arena at the Park at Harlinsdale Farm is presented by Kemp Orthodontics and Randy Jones & Associates. Among the polo match and other horse demonstrations, Nashville’s own Americana-roots favorites Boy Named Banjo will play throughout the evening. Bites from Buttermilk Sky Pie; Catering and Events by Suzette; Circa; Chuy’s; Daily Dish; Franklin Chop House; Jim ‘N Nick’s; Juice Bar Franklin; MAFIAoZA’s; Nothing Bundt Cake; Scout’s Pub; Sperry’s; Taziki’s and Yat’s Cajun Creole will delight the crowd. Lipman Brothers and the R.S. Lipman Company will provide wine, beer and a specialty cocktail. Tickets, which includes food, drinks, live entertainment and a live and silent auction, are available for $100 per person. And for the first time, a general admission ticket is available to watch the polo match for $15. Gates for the match open at 6 p.m. and the first ball drops at 6:30 p.m. Concessions will be available, as well as face painting and balloon animals for family fun. Barnhill says tables and tickets are selling quickly, and she expects a sellout. All proceeds benefit Friends of Franklin Parks and the organization’s efforts to continually enhance and connect the City’s 16-park system. Additional sponsors include: Amy Cross Nance, Attorney at Law; Berry Farms, a Boyle Development; Berry Farms Animal Hospital; Bell & Associates Construction, L.P.; Burr & Forman LLP; Franklin Synergy Bank; Jones Bros. Contractors, LLC; Stites and Harbison, PLLC; and Tennessee Equine Hospital, along with CJC Technologies, Ford Custom Classic Homes, Lee Company, and Barry and Jackie Alexander. 2017 Raise the Roofs Event Chairs Chad and Kelly Dannenfelser and Renee and Ashley Hill. The event, to be held Saturday, August 19th from 4:30 p.m. to 7:30 p.m., will take over the Tractor Supply Co. Arena at the Park at Harlinsdale Farm, with a tented grass berm and the natural beauty of the farm as a back drop. Tickets to the event, which includes food, drinks, live entertainment and a live and silent auction, are available for $100 per person. And for the first time, a general admission ticket is available to watch the polo match for $10. All proceeds benefit Friends of Franklin Parks and the organization’s efforts to continually enhance and connect the City’s 16-park system. Chairs Renee and Ashley Hill and Kelly and Chad Dannenfelser have spent the spring months planning the event, along with Design Chair Stacey Perry of Down to the Wire. Ashley Hill, a Friends of Franklin Parks Board member, is executive vice president and chief banking officer at Franklin Synergy Bank, and Renee Hill is a tax and estate administration paralegal at Bass, Berry & Sims. Chad Dannenfelser, also a Friends Board member, is neuroscience area manager at Avanir Pharmaceuticals, while Kelly Dannenfelser is a long-range planning supervisor with the City of Franklin. 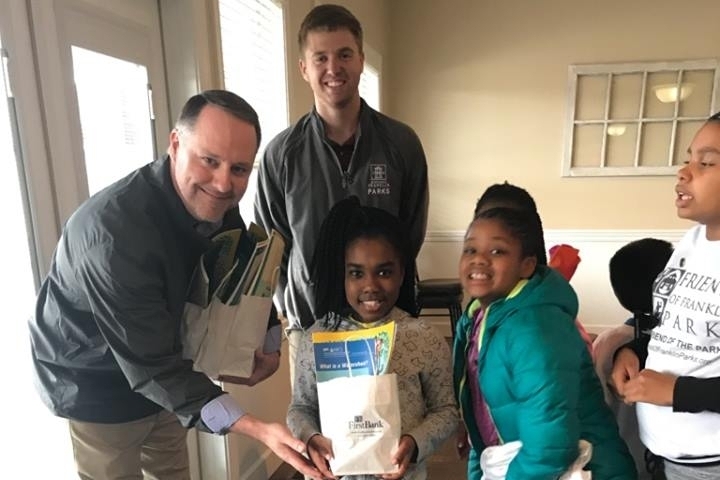 “We’re fortunate to have both the leadership of our Board and event chairs as well as the support of the community as we approach our largest fundraiser of the year,” said Torrey Barnhill, executive director of Friends of Franklin Parks. “This is an event that people look forward to all year long, because it’s unique and fun and is dedicated to a cause that people hold dear. The ribbon-cutting ceremony for the opening of the Equestrian Trails at The Park at Harlinsdale Farm was held Monday afternoon. Trails will be open to the public. The new equestrian trail is open to all horse and stable owners as a self-guided trail throughout the park, uniquely located next to historic downtown Franklin. The trail features 2.62 miles of standard trail and .33 miles of advanced trail throughout the historic farm, once known as the birth place of the modern Tennessee Walking Horse. The ceremony was followed by a reception at the Tractor Supply Co. Arena with food by Catering and Events by Suzette. From the city and parks department, Mayor Ken Moore, Lisa Clayton, Eric Stuckey, Kevin Lindsey and Executive Director of Friends of Parks, Torrey Barnhill and Dr. Monty McInturff were all in attendance. Members of Friends of Franklin Parks, Franklin alderman Brandy Blanton, Heritage Foundation members and community leaders and friends also attended. Trail and park amenities include trailer parking, tie rails throughout the trail course, rules and information kiosk, and restrooms. The trail will be open for public use on Tuesdays, Thursdays, and Sundays from 30 minutes prior to the official sunrise, to 30 minutes after the official sunset. The trail was funded by a Recreation Trails Program grant, which aims to provide trail funding for recreational uses. The City of Franklin Parks Department staff constructed the trail and amenities. For a detailed listing of trail rules and regulations, please visit the City’s website at www.franklintn.gov/parks. For more information, please contact the Parks Department at 615-794-2103.